I stood in quiet fascination in front of the bin of watermelons at the supermarket watching people make their selections. Buying a watermelon is a bit like investing in the stock market; it takes lots of time and patience, and in the end you are never assured a good return. To buy one at its peak, you need to learn the subtle signs of ripeness and patience is certainly a virtue in the quest for ripe perfection. I don’t know if it’s the look, or the particular sound it makes, or the melon’s weight, but some seem to have figured out the secret language of watermelons. It often begins with a survey of the offerings, and when potential candidates are spotted the ritual begins. It may appear a bit silly, all the fervor, but I understand the need for it, having been disappointed on many occasions cutting into a mealy, flavorless watermelon. First there’s size and weight; the watermelon should feel heavy. When comparing its weight with one of similar size, you want to choose the heaviest one, indicating that it’s full of juice. Watermelons are more than 90 percent water, so the juiciest ones are going to be the ones that are heavy for their size. Pick up a few that are the same size in the bin and keep the heaviest ones. Then look for a creamy patch called the field spot. This is the place where the watermelon rested on the ground. It is said, the yellower in color, the longer the watermelon was on the vine maturing and sweetening. Apparently, yellow is better than a white spot, but white is better than no spot at all. Finally comes the controversial thumping technique. Some insist that the tap and listen method is the way to juiciness, while others claim it unreliable. It usually involves a series of taps, using either the knuckles or the palm of the hand, giving the watermelon a few good whacks, while bending over closely to listen to the telling sounds it produces. Believers say to listen for a melon that sounds hollow; if you hear a thud, you’re dealing with a fruit that isn’t ripe. This ritual continues indefinitely until the perfect specimen has been found which can involve tapping and whacking every melon on display. Of course, the very best watermelon is the one that goes from field to table the most quickly, so buying local watermelons is ideal. 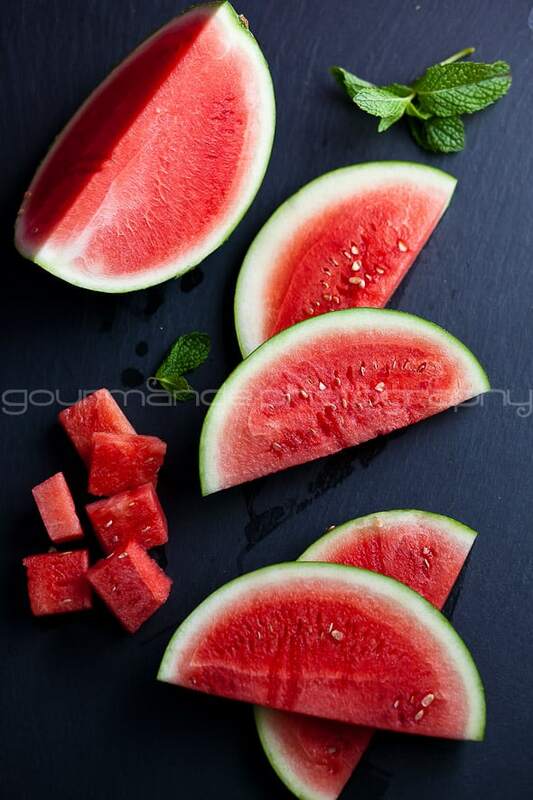 Don’t buy a watermelon that isn’t yet ripe thinking it will ripen by the time you eat it, watermelons do not continue to ripen once they have been harvested. The above having been said, choosing a good watermelon does involve a fair deal of crossing one’s fingers and hoping for the best. The salty-sweet combination of watermelon and feta is exquisite. The intervening minutes between mixing and serving is when everything happens. 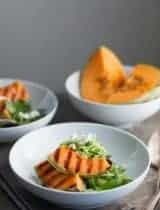 The watermelon turns sweeter, its flavor amplified by the salty feta and its mouth-quenching moisture complimented by a drizzle of rich balsamic vinegar. 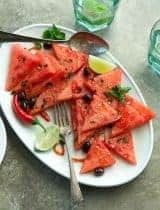 The juicy crispness of the watermelon flesh combined with crunchy cucumbers, sweet heirloom tomatoes, salty black olives and fragrant mint and basil, has become one of my favorite ways to enjoy it. It’s reliably refreshing whether I’ve managed to pick a perfect melon or not. How do you pick a watermelon? 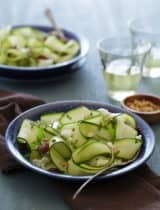 A refreshing salad of watermelon, cucumber and heirloom tomatoes. 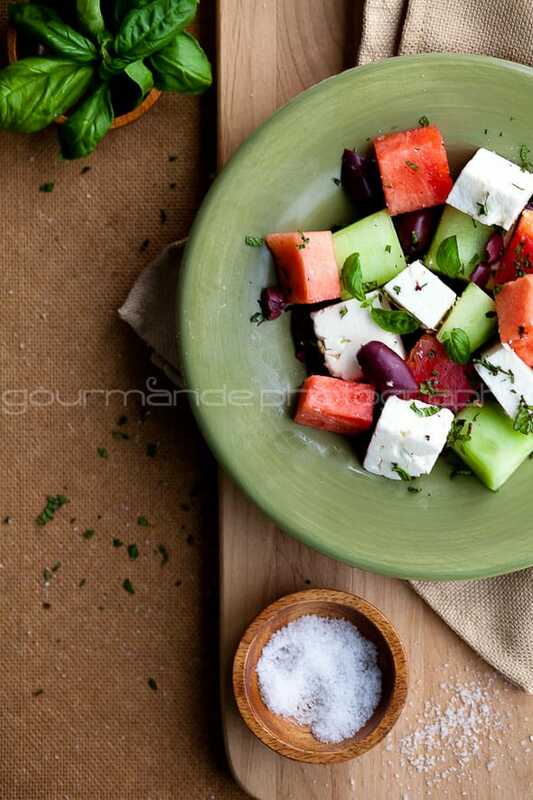 Combine cubes of heirloom tomatoes, cucumbers, watermelon, feta cheese and olives in a medium sized serving bowl. 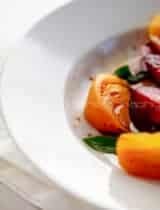 Whisk together the balsamic vinegar and extra-virgin olive oil and drizzle over the mixture. Sprinkle with chopped herbs, add sea salt and pepper to taste. Toss gently to combine and serve immediately. Such gorgeous photos! Lovely salad. 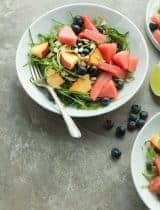 I've been adding watermelon to salads this summer too, and recently made an arugula, watermelon and avocado salad. I love the sweetness and texture it adds. I love watermelon and feta. I can't wait for the local melons to appear at the farm. This is brilliant! I want a nice plate right now!! I am ashamed to say that I do not go through the picking process you've mentioned above. I look at it and if it isn't damaged I buy it. All of your tips are great and very useful. Specially the one about not continuing to ripen. Your salad looks exquisite! I also recently paired watermelon with feta and it is a great combination. Love your photos! I absolutely adore your blog and your beautiful photos. 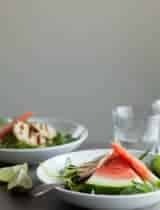 This is such a lovely post and I love the watermelon salad; so refreshing for summer's day like today. Keep up the beautiful work! Stunning photos! 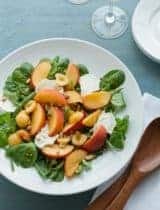 I love this salad - the flavor combinations is just perfect. Screams summer!! This is exactly what I was looking for when I went searching for a salad using watermelon. Thanks. I am totally i awe of your talent, Sylvie. What gorgeous photos and I love your tips! I have been buying watermelon cut up already just because it seems easier. Another tip that usually works when buying watermelon is to look for brown "crackling" marks along the watermelon, that indicates (or so I'm told) that bees were busy at the melons. It's worked for me! And if I buy a melon that is mealy, bland, tasteless, I bring it back. They are so expensive here, some stores are asking $7.00!! Make a fist and rap twice on your forehead: that is the sound of a watermelon that is not ripe. Rap on your stomach: you hear the sound of an overripe melon. Rap on your chest: that is the sound of the melon you want. If you think someone rapping on melons looks strange, imagine someone rapping on her chest and then on a melon. Uh-huh. 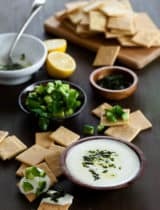 What stunning photographs and a great recipe! This is one of my most favorite summer foods. First, your pics are absolutely stunning. Also, if you want just a touch more nuance in the taste a little bit of diced red onion adds some dimension. Thanks for the great recipes! What beautiful photos. I especially love the feta and watermelon all lined up in rows. What lighting are you using here, some looks to be natural light???? Yes, they are all shot with natural light. 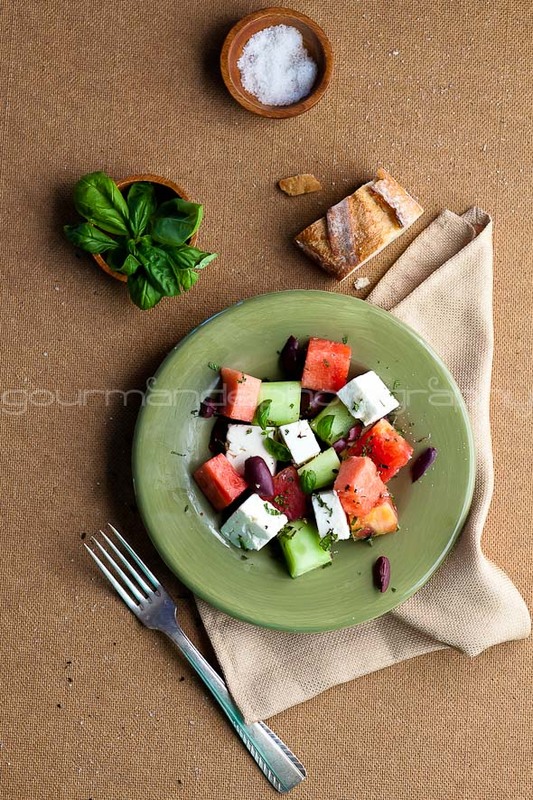 The photos look amazing and the combination of feta and watermelon sounds yummy. Will try it out. I make a salad using feta cheese with gorgonzola beans and lots of herbs like parsley, basil and mint. Thanks for visting my blog and for the lovely compliments.